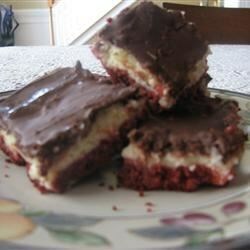 "My cheesecake cookie bar recipe gives you the taste of decadent cheesecake without the hours of cooking and preparation. You can have it with a simple recipe that uses a cookie mix to speed up the process. My cheesecake cookie bar recipe cooks nice and fast too, so you'll have a delicious treat in record time!" Preheat the oven to 400 degrees F (200 degrees C). Butter a 9x13-inch baking pan. Stir cookie mix, 1/2 cup butter, 1 egg, and food coloring together in a bowl until just combined. Spread cookie dough into the prepared pan to cover entire bottom surface. Beat cream cheese, sugar, 1/2 cup butter, and 3 eggs together in a bowl using an electric mixer on medium-high speed. Add flour, heavy cream, and vanilla extract; mix until smooth, about 2 minutes. Pour cheesecake layer over the cookie dough layer in the pan. Bake in the preheated oven until cheesecake layer is slightly golden and firm to the touch, 30 to 45 minutes. Let cool. Melt chocolate in a microwave-safe bowl in 30-second intervals, stirring after each melting, about 90 seconds. Pour over the cooled cheesecake. Cover with plastic wrap and refrigerate until set. Cut into bars and store in the refrigerator. Red Velvet flavor on the go! The directions for making the cookie crust are based on the particular brand of cookie mix mentioned. Follow instructions on the box if using a different brand.